I haven't had my cruise control for a while now. There is an "ENGINE SYSTEM SERVICE REQUIRED" message that looks scary, but really means that there is a code being thrown ***not a CEL code which you could translate with a scan-gauge!!!! However, after every time I try to trade my car in at countless dealers I get the same response: "You got a check engine light on, we'll just deduct that from your trade-in value..." anyway I decided to go to a junk yard and get one of these off of a dead s60 and swap it for my bad unit. 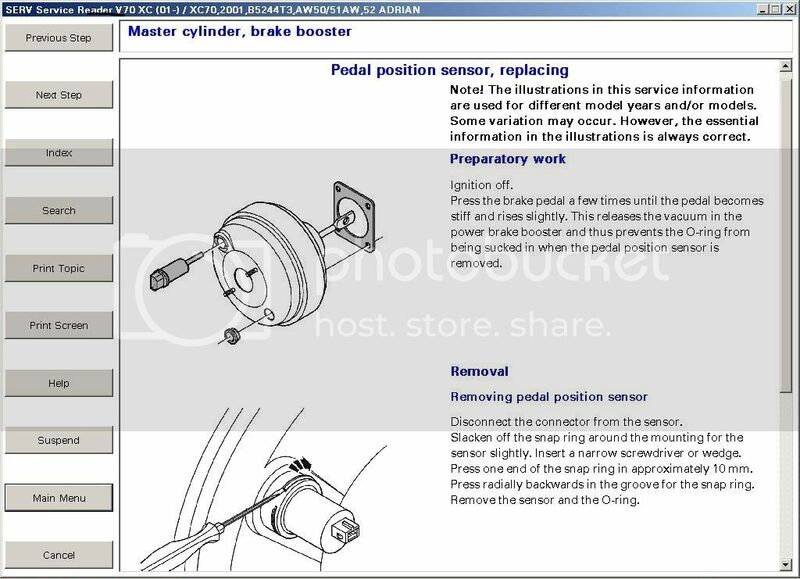 It's called a "brake pedal position sensor" and any shop (especially dealerships!) would love it if you came in and let them charge you $200 to replace one of these. Go to junkyard, spend $10-$15 and then come home and follow these instructions. Should take 5-10min in your garage. No special tools required. FYI: The region which these photos refer to is on the driver side, directly under the brake fluid reservoir. 2001 V70T5 White Exterior/Taupe,Oak Interior, 18" Pegs, Bilstein HD, USA-Spec, volvo coolbox, tint and Xtant 1700watt sub, Blaupunkt components, Kenwood Amp. I thought "Engine System Service Required" was a reminder for routine oil service every 5000mi? Any way, my cruise has been very flaky, and intermittent. Maybe this is my problem-I will try it. Nah, there is a separate light that's in the right-hand side of the cluster under the fuel gauge. It actually reads "SERVICE". 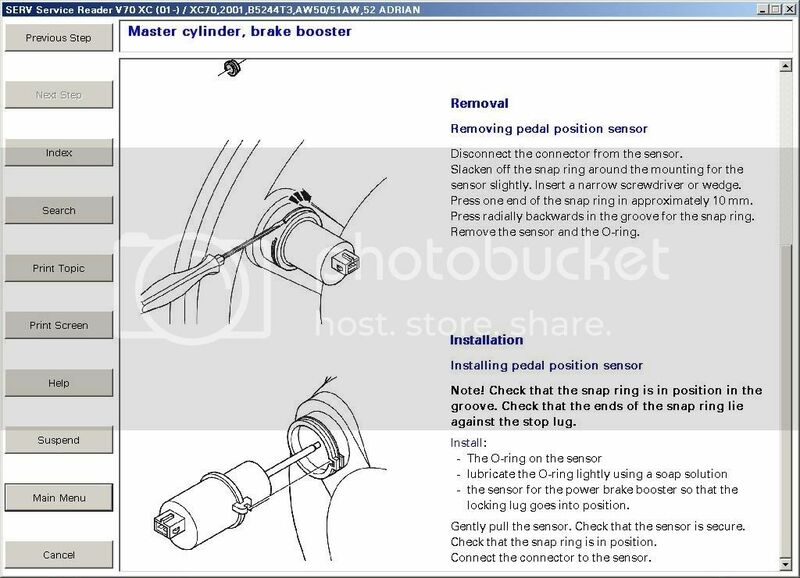 The "ENGINE SYSTEM SERVICE REQUIRED" message can often yield OBD2 codes, usually for O2 or MAF problems. This message went away about 50mi after I replaced the brake pedal position sensor.